Burn Cottage is a 28 hectare vineyard, farm, and estate in the foothills of the Pisa range in Central Otago, New Zealand. The vineyard is owned by husband and wife Marquis & Dianne Sauvage, who purchased the unplanted property in 2002. It had been grazed by sheep for as long as can currently be remembered. There were, and are, no immediate vineyard neighbors. The site was much coveted in the region, for it is sheltered from both northerly and southerly winds by large hills and forms a beautiful, protected bowl much like a modern amphitheater. It is a phenomenal site for Pinot Noir, and they firmly believe that great wines are not made from fruit; they are born of the soils which nurture the vines and made with minimal intervention winemaking. 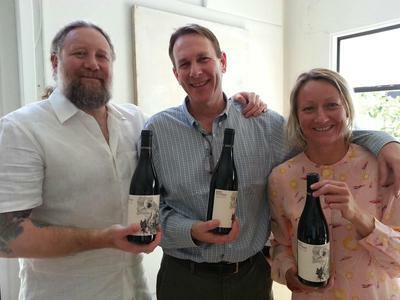 Marquis Sauvage sought out Ted Lemon, owner and winemaker of Littorai in Sebastopol, CA, to plant their new vineyard. Ted proposed that Burn Cottage would be Biodynamically farmed from inception, and that is the path that has been followed with great commitment and enthusiasm. From there, a great partnership was formed, thanks to the potential of the land as well as Ted’s deep connections to New Zealand, and particularly, to Central Otago. Ted is head winemaker and vineyard manager, and as Marquis calls him, “the guiding hand on the tiller at Burn Cottage.” Similarly to Ted’s property at Littorai, Burn Cottage is a fully functional farm, with 10 hectares under vine and the rest of the land devoted to cattle, chickens, beehives, olive groves, and other native species of New Zealand plants, bushes, and trees. They also produce their own compost and grow many of the preparations needed for Biodynamic farming. At Burn Cottage, they believe that biodiversity is the cornerstone of healthy farming. The first blocks at Burn Cottage were planted in 2003. The vineyard development has continued at a loving and deliberate pace to ensure that only the best plant material has been used. When all blocks are mature, total production should peak at approximately 5,000 cases. The Pinot Noir is planted on north and north east facing slopes. Despite the fact that New Zealand is comprised of islands, the climate of Central Otago can be best be described as continental; with warm summers and cold winters. There is plenty of sunshine with particularly long warm days through the growing season and cool nights that help achieve ripeness while retaining good acidity. The soils in the vineyard are derivatives of broken down schist and granite. They are classified as free-draining sandy loams. Most of the terrain is made up of old river beds pushed up by glacial movements.